You can colour me surprised. Even with all the rave reviews and the excellent word-of-mouth, I really didn't think that The Lego Movie was going to be much good. The Lego franchise has felt overbearing to me over the past few years, with all the tie-in games - Lego Star Wars, Lego Harry Potter, Lego Marvel superheroes...none of which I've been remotely interested in. Then came the trailer for this film, full of humour that seemed to be trying way, way too hard and the less-than-appealing tagline of 'From the creators of Cloudy With a Chance of Meatballs'. That it was animated by Animal Logic, whose Happy Feet and Legend of the Guardians I enjoyed would have been a bit of a plus, but I didn't actually find that out until the closing credits. By which time, of course, I was completely converted. The thing about glib, self-effacing humour is that out of context - like in a trailer - it's a lot harder to tell that it's undermining parts of the character and just seems goofy. In the film itself, it was a lot funnier, and a lot more likeable. And that's what The Lego Movie has done well - be likeable. And that despite also going for a biting bit of satire on modern life, which is quite an impressive feat. Plus it is very clearly aimed at Generation X as opposed to the teeny kids of today, who I imagine were mostly confused by the trippier moments and cameos from Teenage Turtles and Lando Calrissian. This is one way that the Lego movie could really stand out - being able to use the characters from their toy ranges and mash them together...though I'm guessing there was some kind of deal with DC so that only their comic superheroes made it. It's a hell of a lot of fun to see Batman interacting with the crew of the Millennium Falcon, especially with them all exaggerated versions of themselves, not to mention a council that includes Dumbledore, Gandalf and Abraham Lincoln in his space chair. And, of course, Michaelangelo the artist and Michaelangelo the turtle. From the beginning the film establishes its silly tone: a very funny prologue sees Will Ferrell's character Lord Business stomping on brilliantly ridiculous boots to overwhelm Morgan Freeman's silly old wizard character Vitruvius and establish control over the film's Macguffin. We then have the main character introduced: the construction worker Emmet, who lives in a world that despite what you may have read is far more Huxley than Orwell: everyone is kept brainlessly happy, placated by mindless entertainment and overpriced coffee instead of Soma, which has the added appeal of, y'know, actually being a recognisable critique of modern American culture. Though everything is awesome - as the earworm song goes - Emmet is not only incredibly dull, but very lonely as well. He has no real defining characteristics and no friends. His comfortably life is shattered, of course, when he sees a (beautiful) intruder on his construction site, then happens upon the 'Piece of Resistance', a piece that can put a stop to the evil plans of Lord Business. Now a target of Lord Business and his brilliant henchman Bad Cop - who also has a good cop face, and is voiced by Liam Neeson having the time of his life - but falls in with the faction of the Master Builders, including Vitruvius and the beautiful Wyldstyle, who have the ability to disassemble the Lego parts around them and reassemble them into things that suit their needs. With them, Emmet discovers the other worlds kept apart from his - the Wild West, the medieval world, and even the mish-mash of 'Cloud Cuckoo Land' where denizens like the intensely cutesy Uni-Kitty reside. But since Emmet has the 'Piece of Resistance', Lord Business will not rest until he is captured. The broader context of this, of course, ends up being that classic of self-referential toy franchises, the tension between the adult collectors who become obsessive about perfection and the idea of children actually using toys as intended and being creative. Hinted at from the start with 'relics' like highlighter pens and Vitruvius' chewed-lollipop staff, there's a live-action portion that jars a little at first but ultimately works and for all that it is an obvious concept, also seems like exactly the statement a Lego movie ought to make. The film perfectly balances its silly humour, its epic adventure and its more serious message about creativity being stifled - with an amusing stinger about a little sister to boot. There's an eagerness to undercut sacred cows that works particularly well here, with an incredibly goofy Green Lantern, Batman's hilarious angsty song (with a final line in the version played at the end credits that is possibly the edgiest thing I've heard in a kids' film, in a song parodying edginess no less) and a very amusing version of Lando Calrissian from Billy Dee Williams himself. Add in spices of The Matrix and Toy Story, and it’s a success story. 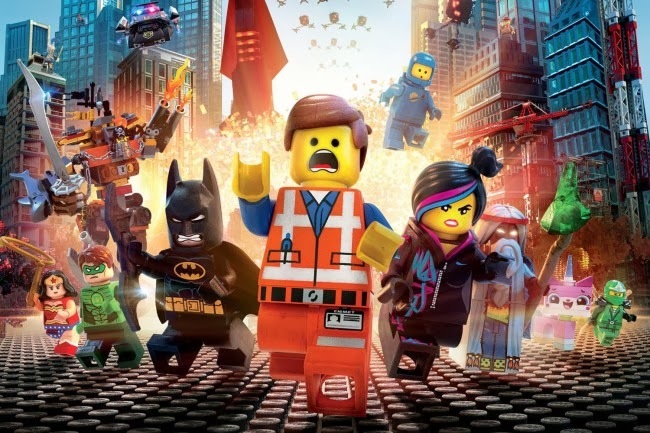 What the Lego Movie does, it does very well - it's hilarious, it makes you like its characters, it's irreverent and it looks good, too. It's restrained, of course, by the need to look like Lego, but while that could have been a disadvantage, it also makes for the best visual idea here, which is to make all the explosions and lasers and other visual effects be constructed from CG Lego bricks as well. Great idea. One of many, which is why this unlikely film can be such a success story. It's also nice that I'll be able to have this critical success to point to the next time someone claims that 80s cartoons being toy adverts precludes any sort of artistic merit. I'm in agreement with you about The Lego Movie. I saw the trailer and all I could think of was "Really? A movie about Legos? It looks like all it has going for it is pop culture jokes and the 'ordinary guy becomes the hero' story we've seen over and over...there's no way this can be good!" Of course I had no desire to see it...until it came out and all I heard were good things about it. So I gave it a try and feel pretty much the same about it as you do. It was funny, creative, and the overall message about imaginative thinking versus strict order was carried out very well. Even before I saw the movie I heard there was some kind of twist ending and took a wild guess that it involved the idea that the Lego world took place within the real world and there would be real people controlling the Legos - and turns out I guessed right XD But I didn't know exactly how it would play out, and having the whole thing with the boy and his father was a great way to drive the message home and bring everything together. The only thing I didn't really like was how Emmet actually moved in order to get the boy's attention, as that kind of shattered the whole idea that the Legos are alive only in the boy's mind. But other than that and maybe a few other little things, it was a well written and entertaining movie. It definitely proves that even a movie that seems like it only exists to sell toys can still be something artistic and worthwhile if enough effort is put into it. Yeah...I guess they had to weigh up the idea that it was all the wonder of a child's imagination with the idea that it was actually something more than that, and there was some reality to what we were watching. They opted for that Hollywood twinkle, I guess!